Traditional Italian architecture has always been a source of inspiration for architects in urban planning. Starting in the 40s, urban planners in the U.S. tried to develop their own style based on European model to meet the demands created by the new wave of city renewal projects. In particular, a group of leading architects in the country gathered in Boston for the redevelopment of the Government Center. While designing a plaza surrounding the Boston City Hall, the architects borrowed some ideas from one of the most famous and successful Italian piazzas- Piazza del Compo in Sienna. However, the adaptation of the American plan eventually rendered the two public space as distinct from each other in many aspects. 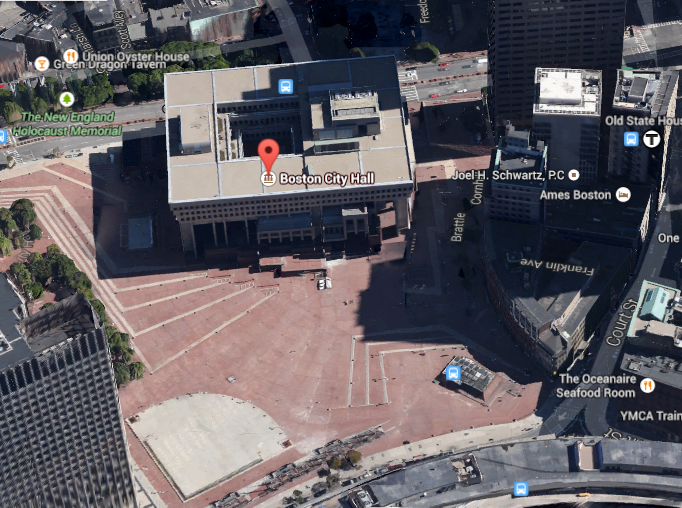 At first glance, one might find the Boston City Hall Plaza (CHP) in many aspects resembles the Piazza del Campo in Siena. Both of them are open spaces around the seat of the city government, with the brick paving and sunken slopes. However, after further considerations, it is not hard to discover the discrepancies between the two. Why do two piazzas that look similar at first consist of so many differences? This question cannot be answered without looking into the intentions behind the respective architectural designs, which shed lights on two models of urban planning and their subsequent impacts. We will look at their differences in four categories, spatial composition, functionality, traffic orientation, and incorporation of surrounding building groups, in order to make some sense of the different outcomes produced by the architectural planning. 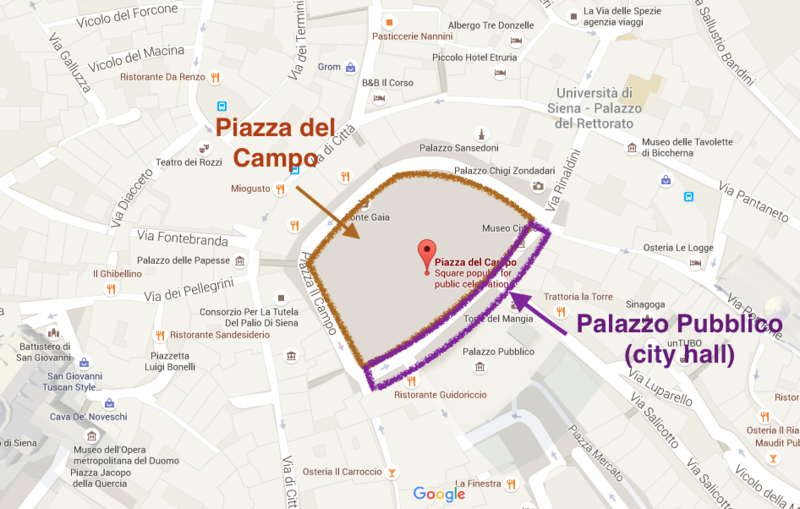 According to the site plan comparison provided by Helfand, we can see that Piazza del Campo is surrounded by building mass, including Plazzo Pubblico which is the city hall of Siena. CHP, on the other hand, creates open space surrounding the Boston City Hall, providing the opportunity for pedestrians to walk around the city hall as if they are appreciating a sculpture. Helfand further suggests that Piazza del Campo is the void in the ground plan whereas CHP has the characteristics of the solid which circumscribes another architectural elements within. Therefore, varying implications result from these different spatial compositions. 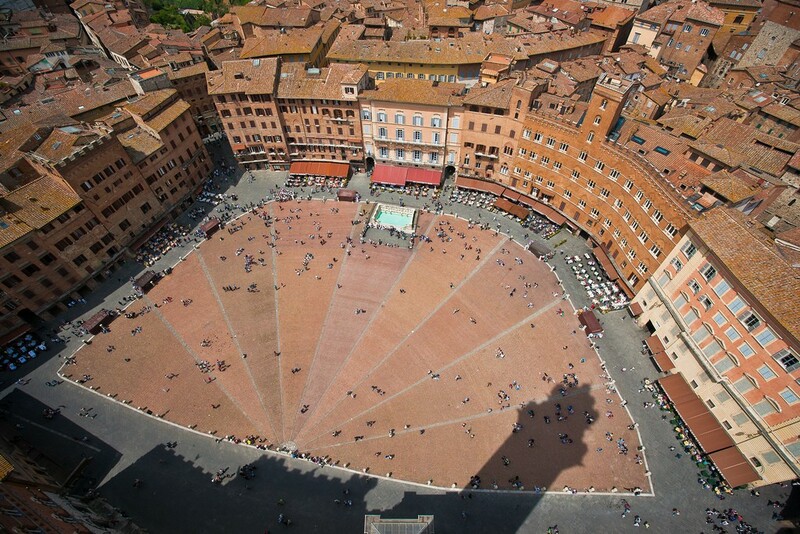 The piazza in Siena is enclosed as a final destination for all the traffic leading towards the center of the city to meet and unite before the city hall. CHP, on the contrary, has a de-concentrating effect on the traffic, diffusing the attention in all direction rather than encouraging convergence. If we break down the building mass around the two piazzas in terms of their functionality, it is not hard to see how the usage of these public openings could be affected by their respective general planning designs. Piazza del Campo is mainly fringing on buildings that emphasize non-office functions. The only office space, Plazzo Pubblico, makes up 1/6 of the building mass surrounding the piazza. The rest of the architectures are combining commercial and residential use with storefront on the first floor and apartments on higher level. 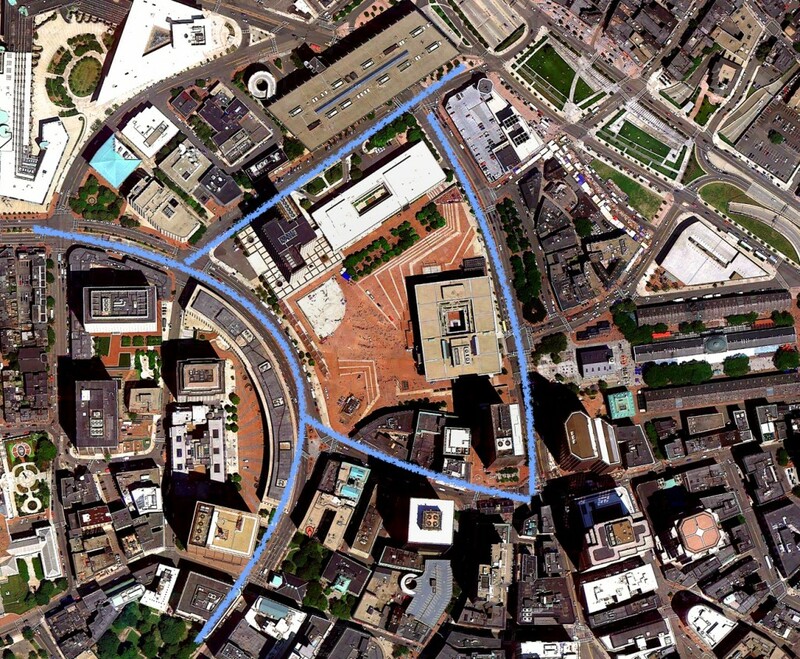 In comparison, only 1/3 of the building mass surrounding the City Hall Plaza in Boston is dedicated to commercial use. The rest of the buildings are all office. There is no residential area immediately bordering CHP. Such difference in the functionality of the surrounding buildings generates different purposes people may attach to the public openings. Piazza del Campo is more frequently used as a space to relax, sit down and wander around after getting coffee or lunch in one of the restaurants on the piazza. We should not overlook the fact that Piazza del Campo is one of the most popular visiting sites in Italy, and the tourists’ mentality really shape the way it is used in our time. Its counterpart, CHP, is an open ground for people to walk through in order to get to their offices. For most people who have interaction with the plaza, there is no reason to linger or appreciate the historical buildings, since there is almost none left. The access to the piazzas is another aspect that we need to consider in order to understand the differences between how each space is utilized. Piazza del Campo is very pedestrian-friendly. It is surrounded by medieval pavements that allow minimum presence of vehicles. 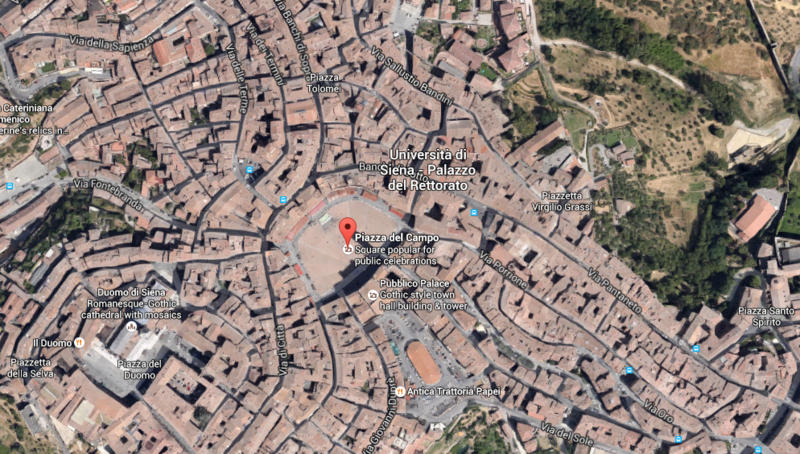 Every meandering road in the town of Siena ultimately leads to its city center where the piazza and Plazza Pubblico are situated. The Sienese design orients the pedestrian traffic to embrace Piazza del Campo, whereas we see no such approach in Boston. Two of the four boulevards surrounding CHP face four or more lanes of traffic. The plaza is basically isolated by large, modern roads that prioritize automobiles over pedestrians (The traffic data is provided to testify the high volume of vehicular use near the plaza). This undermines the meaning of the piazza as an open space for public gathering and for linking buildings spatially. 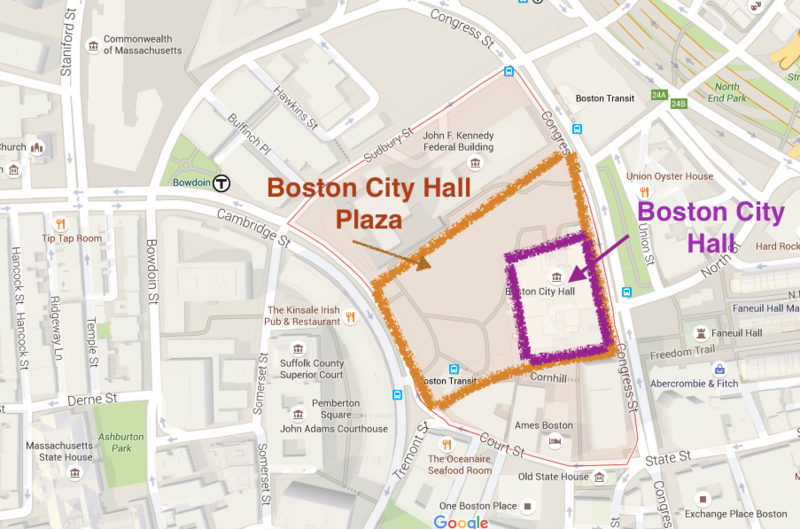 Even though Boston tries to use the plaza for large event such as the Boston Calling, the plaza continues to maintain a pretty weak connection with daily human experience. By this I mean it is hard to imagine people saying ‘hey let’s hang out in the Boston City Hall Plaza’, while this constitute one of the most basic experience with regards to Piazza del Campo. The building groups surrounding Piazza del Campo have similar appearances in terms of their material, style and use of common architectural language. Although the texture of the buildings as a group reflects the same specific time period (Medieval) and geographic location (Tuscany, Italy), there is clear hierarchy among individual architecture. Palazzo Pubblico, the city hall of Siena, towers all the nearby buildings in both height and scale. As a result, the piazza serves as a mediating space between the backdrop of the most prominent building and the rest of the structures in town. The design demonstrates a consideration by the Italian urban planning architects to harmonize the civic and civil life of the Sienese residents by providing a breathing space/opening alleviating the seriousness and rigidity of the seat of the government. It is hard to tell the hierarchy among the structures surrounding the CHP. Indeed, the J.F.K Federal Government building overpowers everything else in height, but the Boston City Hall asserts it authority by the monumentality of the structure. Moreover, the Center Plaza across Cambridge Street facing the CHP has the distinct curvature and a red-brick surface that call for attention. Even though most of the buildings are concrete, modern structures, there is little differentiation among them, let alone hierarchy. On one hand, Piazza del Campo is frequently voted as the top 3 best public spaces around the world. On the other hand, the Boston City Hall Plaza is generally disliked by both community in Boston and people who study urban planning and architectural design. Only 50 years after it was constructed, there have been a handful of proposals asking for its demolition and replacement. 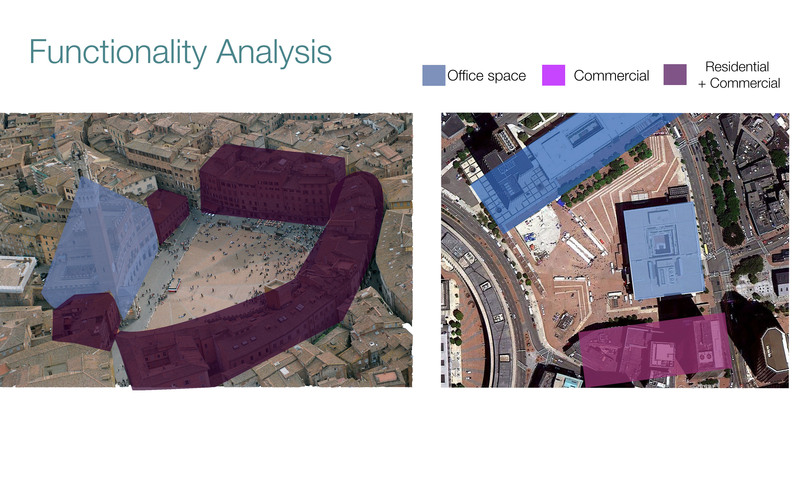 Through investigating the four dimensions of spatial composition, functionality, traffic orientation, and incorporation of surrounding building groups between Piazza del Campo and the Boston City Hall Plaza, we try to provide some insights into the drastically different use, reputation and popularity between the two. Piazza del Campo is accommodated by its surrounding building and the broader traffic orientation to become a lively space that encourages interaction between people and architectural structures. CHP, However, is segmented and isolated in the sense that there is little need for pedestrians to set foot on the plaza except when they are in passing to work or to get to somewhere. 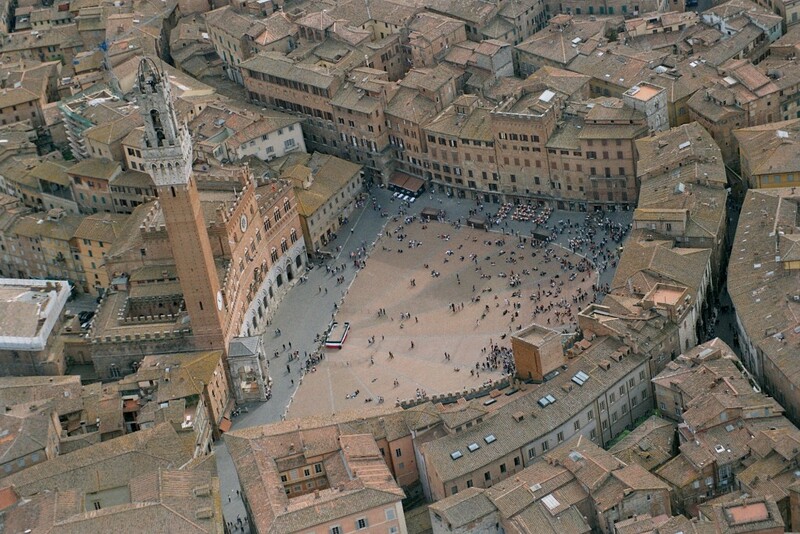 Unlike Piazza del Campo, the CHP is considered neither a destination nor the center of the city. We want to show that the neglect and disfavor it attracts have their roots in its urban planning design. Hopefully the comparison between these two piazzas will provide some lessons for all future generations of architects and urban planners to benefit from. all map views and site plans from Google Map unless otherwise indicated. Mumford, Eric P. Defining Urban Design: CIAM architects and the Formation of a Discipline, 1937-69. Yale University Press. 2009. O’Connor, Thomas H. Building a New Boston. Boston: Northeastern University Press. 1993.